We have a lot of customers who want to refresh the outdoor space on their RV, motorhome or travel trailer by replacing an old, tired and maybe leaky patio awning fabric. It might sound like a daunting task, but practically it’s quite simple and only takes a few hours. Use this detailed task list to complete it with the right steps. 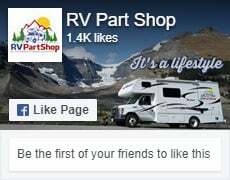 This article refers to the most common type of RV awning, a spring-loaded version. Other types will have similar steps, but adjustments may have to be made. The first thing you will need is two friends to help you (three friends if the awning is especially long. Having help just makes it easier to handle the assembled awning to move it around. Remove main bolts holding the top of the awning to ther RV Awning. Don’t worry, it won’t fall off because of the spring tension in the roller. Disconnect the bottom of the arms on each side from the brackets on lower RV sidewall, extend the legs and place the arm ends on the ground. Flip the control lever lock on right side of roller tube as if you’re preparing to extend the awning. Pull roller tube about a foot out from the RV. Cover the inside of upper awning brackets you just removed with masking or electrical tape to prevent damage to the RV during removal and replacement. Use a sharp edge along the fabric at the awning rail to remove any old sealant that will prevent the awning from sliding in the awning rail. Scrape awany any debris to ensure the fabric will slide properly in the track. Gently spread the end of the channel at the end that you will be removing and re-installing the fabric. Make sure the fabric slides freely in the channel. Pick up the arms and slide the entire awning to one side, removing the fabric from the channel. You may need your third person on the roof to free up the awning fabric from the channel so it slides freely. Lay the awning down away from the RV. It will be easier to work on if you put the roller up on some concrete or wood blocks. Lock the spring at the rear (left) side of the awning by removing the rubber dust cap and inserting a Phillips screwdriver into the hole to prevent the spring from turning. A. Remove the bolt holding the awning arm to the roller bracket and remove the arm. B. Reinsert the bolt and reattach the roller bracket. Cover one side of it with tape to prevent scratching. C. Clamp your vice grips on the bracket to assist in turning the spring. D. Keeping a firm hold on the vice grip, lift up to relieve the tension, then flip the locking lever. Release the spring tension by turning the bracket clockwise. BE SURE AND COUNT HOW MANY ROTATIONS ARE TRAVELLED BEFORE THERE IS NO FURTHER TENSION ON THE SPRING. You will need this information during re-installation. Next, we want to remove the spring assembly from the right side of the awning roller. First, mark the location of the awning control lever on the circumference of the roller with the felt marker so you know where to reinstall it later. Drill out one of the rivets on the end cap of the awning and punch any residual rivet pieces out. With a person on both ends of the roller tube, rotate the tube and remove the other rivet in the same way. Slide the entire right side spring assembly out from the roller at place it to the side. Lift up the roller tube and unwind the old awning turn by turn by flipping it over the tube. When done, use your marker to identify which track the main awning fabric is installed in. Use a different indicator to mark the channel where the decorative valance is installed. Slide the old fabric off the roller to one end. If it sticks, use a knife to make a cut between the two channels holding the fabric. Slice the fabric the entire length of the awning. Spray some silicone lubricant in both channels on the roller to make installation easier. Using the markings you made earlier, slide the new fabric onto the roller. Have a helper hold the new fabric off the ground while you carefully feed the two beads into the channels. Center the fabric on the roller by using a tape measure to measure equal bare roller sections at each end. Roll the new fabric onto the roller tube by lifting it over the roller turn by turn. Roll the fabric as tightly, evenly and smoothly as possible. Reinsert the right-hand side spring assembly back into the roller. Line up the control lever with the mark you made earlier on the roller so you are sure it’s in the same place. Replace both rivets on the spring assembly’s roller end cap using a pop rivet gun and appropriately sized rivets. Reattach the vice grips to the spring assembly bracket, place the control lever in the roll-down position, and turn the bracket counterclockwise the same number of rotations as you required to release the tension. You don’t want it to be any looser or tighter than the original tension. Re-attach the right awning arm to the roller tube bracket and remove the protective tape from the bracket. Next, snap the support arm back into place. Remove the phillips head screwdriver from the left side of the roller and reinstall the dust cap. Clean and lubricate with silicone lubricant the awning rail track on the RV sidewall so that the other awning bead will sliide smoothly within the track. Apply some tape to the sharp edges of the track at the end where you will be inserting the fabric to prevent tearing. Use a flat head screwdriver to make sure the end is spread open to receive the fabric bead. Stand the entire awning assembly up and walk into place so the bead is close to the insert point on the end of the awning rail. Begin walking the awning across the side of the RV, sliding the new fabric into place as you do. The silicone lubricant should make the bead slide smoothly through the track. Once the arms are at their original locations, reattach the top brackets to the side of the RV with lag screws. Make sure you coat the lag screws with a sealant before screwing them in. Remove the tape on the end of the awning rail where you inserted the bead. Retract both arms and re-attach them to the lower sidewall brackets. Roll out the new awning. If the awning strap has been rolled up in the fabric, just pull on both arms to roll out the fabric to full deployment. Then, re-roll it up to ensure that it rolls up correctly and straight on the roller. If the arms don’t line up straight or if the fabric is rolling to one side or the other, pull out the awning and slide the fabric left or right in the track to adjust. Once the awning rolls up straight, replace the holding screws at each end of the awning fabric. You’re done. All that’s left to do is relax and enjoy the shade under your new patio awning.